Cardiac Directions® is a free program that’s designed to be a practical and easy-to-understand educational resource for patients and their family members. 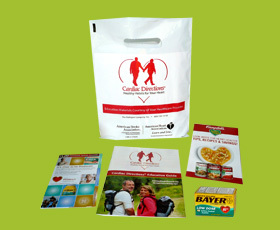 Program materials cover a broad array of important topics, such as: risk factors, the need for dietary change, cholesterol reduction, the importance of regular exercise, and a variety of other health issues that are appropriate for the cardiac patient. 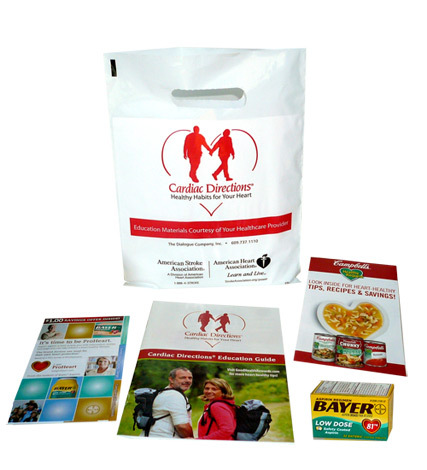 Patient kits are provided in sufficient quantities so that they can be given to each of your cardiac patients. Patient kits are delivered pre-packed, and ready for you to hand out. Please Note: Contents of the kits change from time to time, and specific items may differ from those depicted in the photo. We’re able to offer you the program completely free of charge (we even pay for shipping) because it is funded by a select group of company sponsors, who include their trial size samples and educational materials in the patient kits. The patient kits allow patients the opportunity to try these products for free. All materials are carefully screened for their appropriateness to cardiac patients. You will never receive a bill or any charge for participating, and you may cancel the program at any time without cost or obligation. Our only rule is that you distribute only one gift bag per patient free of charge. There is also a name collection card inside many gift bags, which we'd like patients to voluntarily complete to provide feedback on the helpfulness of the materials. Simply complete & submit the application form. Only cardiac rehab facilities, stroke centers and physician practices based in the continental United States qualify for this program. It is very important to give us accurate patient numbers, because your patient kit quantities are based on these numbers. Patient kits will be shipped to you via FedEx, completely pre-packed. You’ll receive one shipment each year, with kit quantities based on your patient volume. We pay all shipping charges, so there is NO cost to you of any kind. You will receive a request form to update your patient numbers once each year, which you must return to us in order to remain eligible for the program. Otherwise, the shipments are automatic, and always without charge. Remember, if you ever need to cancel the program for any reason, you may withdraw from it at any time without cost or obligation. Guaranteed! Copyright © 2002- by The Dialogue Company. All rights strictly reserved.